In theory, anything can happen in EVE Online, but some things are considered impossible. 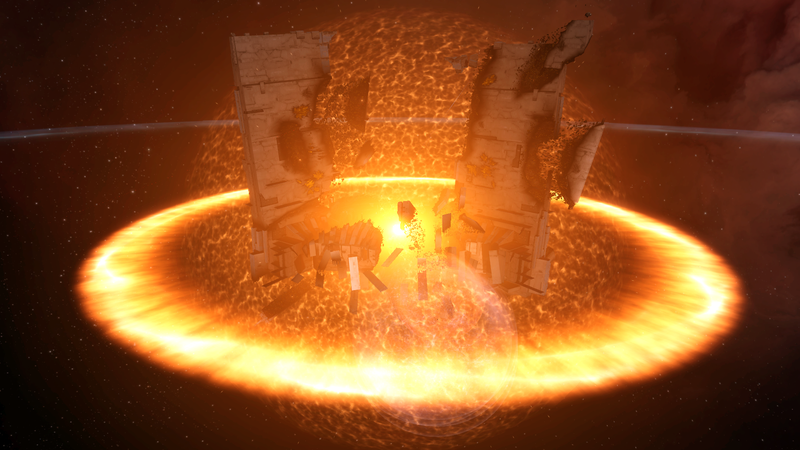 Well, last month, one of the “impossible” things happened: The destruction of the game’s first-ever Keepstar battlestation, which was kept in a wormhole. Of course, it took 11 months of meticulous planning. Ever since the massive Keepstars, the largest structures that can be created by EVE players, were put into the game in 2016, they have lost the sense of perceived invulnerability that they once enjoyed. Over the two years, more than 30 of the extremely expensive structures have been destroyed. But the first-ever Keepstar endured, thanks to its location: Deep in the heart of a wormhole, the most inhospitable space that EVE Online has to offer. Wormholes do not benefit from the ubiquitous stargate network that players use to travel from system to system in the majority of EVE space. They must instead be accessed via temporary tears in the fabric of space that randomly appear throughout the entire galaxy. These rips in space are incredibly unstable: They decay over time, they collapse if too much mass passes through them, and they impose restrictions on the size of vessels that can squeeze through them. Wormholes also don’t have Local Chat, which is a persistent channel that displays everyone inside a system in real time and makes it easy to see if your enemies are in your system watching you. These factors make incredibly difficult logistical challenges for players trying to live inside the broken and scattered wormhole systems. So why do they bother? Because with this risk comes potential rewards. Wormholes are considered to be some of the richest space in all of EVE, full of lucrative resources—resources that the alliance known as Hard Knocks used to craft the first Keepstar. Some wormhole systems are inherently better than others, and Hard Knocks has lived in one of the best of them for quite some time. Their home system, is officially named J115405, but the vast majority of players know it as “Rage.” Through a combination of massive wealth, admirable player skill, and dogged persistence, the players of Hard Knocks established themselves as the top predator in the wormhole ecosystem. When citadels were first introduced to the game, Hard Knocks was in the unique position to be able to immediately begin construction of the first Keepstar, known as—what else?—Fort Knocks. Building Fort Knocks and placing it in a wormhole took months of planning, hundreds of billions of ISK, and the combined efforts of the entirety of Hard Knocks. Fort Knocks was almost stolen before it was assembled by nefarious industrialists, and the convoy operation to bring the Keepstar safely to Rage narrowly avoided discovery. But the story of building something in EVE is always going to be only the first half of the story. No one has ever done anything great in EVE without someone else wanting to destroy it. Soon after the players of Hard Knocks finished building their sandcastle, players in an alliance called The Initiative began planning to kick it over. The events that would lead to the fall of Fort Knocks began in December of 2017, during a discussion between two players in The Initiative, Riven Avaren and Pandoralica. They were discussing the aftermath of a battle over another Keepstar. The attackers’ fleet composition had showed promise, they thought, but had been unable to get the job done due to the enemy’s defenses, fleets of massive supercapital ships. The two players schemed of using a similar fleet to fight a Keepstar that didn’t have the benefit of massive supercapitals defending it. Eventually, one of them joked that the only place to find that would be deep in Wormhole space. It wasn’t a serious suggestion, because the inaccessible nature of wormholes meant that Keepstars should be invulnerable as long as their owners defended them. Ultimately, the seeming impossibility of destroying a wormhole Keepstar came down to a pure numbers game. To defeat it, they would need hundreds of players flying battleships, and hundreds more in smaller support vessels. But wormhole entrances appeared in random places, and their inherent instability meant that even attempting to bring in a fleet capable of destroying a Keepstar would cause them to collapse on themselves after only a few ships went through. Even if the wormhole were to stay open, Hard Knocks could defend it by “rolling” it. Rolling a hole is when players will intentionally travel through a wormhole in specially designed, incredibly high-mass ships with the intent of quickly triggering the wormhole collapse. Talk of destroying the Keepstar drifted out of the conversation. Apparently, it didn’t drift too far out of Riven’s mind though. Over the next month, Riventook it upon himself to attempt to find a way into Rage, just to have a look around. It is generally much easier to find a navigable route into a specific wormhole if you can work from your destination, and try to find connections that lead to where you want to be coming from. Riven, his friends, and his allies began doing just that. Then they started moving in. Wormhole’s lack of Local Chat meant that new ships entering the space wouldn’t immediately be apparent, as long as they were hidden well enough. With a scout safely positioned in Rage, they began to move freighters full of battleships into the wormhole. Over the course of nearly a year, many different methods were employed to sneak these massive, slow ships into Rage. Members of The Initiative spent months racing Freighters across dangerous low-security systems, using Titans to launch them light years across space with jump portals, and sneaking them through other connected wormholes which would collapse behind the freighters due to their incredible mass. Hours were spent late at night, often close to the game’s daily downtime in the wee hours of the morning, so that American players could better hide The Initiative’s actions. Detail of a propaganda piece produced by The Initiative following the siege of Fort Knocks. The process was not without its hiccups. Two freighters full of ships and resources were lost when “suicide gankers,” roving thieves unconnected to either entity, saw the unarmed ships traveling through security space and destroyed them. But the true nature of the operation was never discovered, and in the end, 46 freighters containing 750 Raven-class battleships, 800 smaller support vessels, several forward staging structures, and vast amounts of fuel and ammunition were covertly seeded inside of Rage, waiting for the assault to begin. In Pandoralica’s estimate, that the total cost of seeding The Initiative’s ships into the wormhole was close to 600 billion ISK. Roughly converted into real world currency via the game’s PLEX system, that’s nearly $8,000. With all of the assets finally in place, there was only one thing left to do. On December 8, The Initiative issued a call to arms to its full roster of members, urging them all to log in and participate in an undisclosed operation. Over 550 members of The Initiative logged in to answer the alliance’s call to battle. Elsewhere in EVE, allied fleet commanders in The Imperium and in Snuffed Out were asked to provide additional numbers to help the operation. All together, close to a thousand players undocked from their respective homes and made their way into carefully-mapped wormhole chains, hurtling towards Rage. Out of the thousands of players assembled for the operation, only a handful were actually aware of what was about to happen. Up to this point, the assault on Rage had been kept on a strictly need-to-know basis so that spies would not inform Hard Knocks and give them a chance to defeat the attack before it began. It was only as the fleets converged in Rage that their objective quickly became clear. The combined fleets began dismantling Hard Knocks’ infrastructure within Rage, destroying Hard Knocks starbases and replacing them with ones belonging to The Initiative. As soon as the first Initiative starbases came online, the hidden freighters, some of which had been squirreled away in the wormhole for nearly a year, began to log in and fly to the newly-anchored safe havens. Logistics teams parsed the contents of the freighters and began assembling the Raven-class battleships inside them, filling them full of missiles and handing them out to waiting Initiative members. Instead of flying battleships into Rage, they had flown smaller, lighter vessels to prevent the wormholes from collapsing behind them. Once they were safely inside, they traded up to more powerful weapons of war. Once the first Raven fleet, numbering 255 ships, was fully formed, the siege of Fort Knocks began. The Ravens and their support ships began pounding the Keepstar with long-range cruise missiles while the remainder of The Initiative’s fleets and their allies maintained what EVE players call “hole control”—the act of securing a wormhole from outside invaders. This relies on defenders to be on constant alert, since when a wormhole connection collapses, it’s only a matter of time before a new one spawns. Defenders must immediately locate the new connection and make sure nothing comes through it before it can be “rolled” to a critical level and be considered secure. The Initiative and their allies would need to maintain hole control around the clock for days on end to ensure the destruction of Fort Knocks. They did so almost perfectly. Pandoralica told me recently over Discord that The Initiative had only lost hole control for less than 10 minutes during the entire operation, which lasted over a week in total. The overwhelming force brought into Rage by The Initiative left Hard Knocks with very little in the way of options. Wormhole alliances are typically nowhere close to the size of the enormous nullsec alliances, and the fleets that The Initiative brought to Rage likely had more players in them than the entirety of the Hard Knocks alliance. A large portion of the other groups that live in Wormhole space did rally to Hard Knocks’ aid, attempting to roll the wormhole connections into Rage to supply reinforcements and attempt to wrest hole control from The Initiative. Even groups who had previously suffered at the hands of Hard Knocks began attempting to come to their defense, under the banner of solidarity with their fellow wormhole dwellers. But it was all for naught. After a few days of The Initiative holding control of ingress into Rage, Fort Knocks fell. The first Keepstar in EVE Online exploded into a massive shower of wreckage, scattered its contents across the battlefield. In wormhole space, unlike in normal space, when a structure is destroyed anything kept inside it has a chance of being thrown into space for the attackers to scoop up and take home. Players from the attacking fleets spent hours cleaning up the wreckage, digging through thousands of containers ejected from the exploding space station, gathering as much they could fit in their cargo holds. The Initiative flew in formation to create the alliance’s logo in space amidst the wreck of the second Keepstar. The Initiative and its allies continued the campaign of destruction over the next few days, destroying all remaining infrastructure inside of Rage that belonged to Hard Knocks. There was actually a second Keepstar in the wormhole, and that got destroyed, too. Eventually, Hard Knocks went from defense to full-on retreat, shifting its focus toward trying to recover and evacuate its remaining assets. In the weeks that followed, Rage calmed down. As of today, there are a few players left from the fleets still on the inside. A few scouts were left behind to make access to the wormhole easier in the future, and Hard Knocks has withdrawn to other areas where it still holds control. The repercussions of the daring assault will surely be felt throughout EVE. In the aftermath of the battle, other wormhole-based groups have begun to question the wisdom of holding all of their assets inside of their home holes. Lazerhawks, another wormhole group with several Keepstars inside of their home, has begun the process of unanchoring them, possibly to remove them as targets and to secure their assets elsewhere. Meanwhile, suicide gankers in high security space have reported destroying massively valuable freighters full of assets that look suspiciously similar to what you would expect to see in a wormhole-centered player’s hangars—the implication being that some wormhole groups are starting to evacuate. Although Fort Knocks is gone, Hard Knocks remains. They were always a resilient, resourceful bunch—you’ve got to be, to live in a wormhole. Most players expect them to rebound, recuperate, rebuild, and then—when the time is right—get revenge.